In the digital world, sixty seconds is an awfully long time. 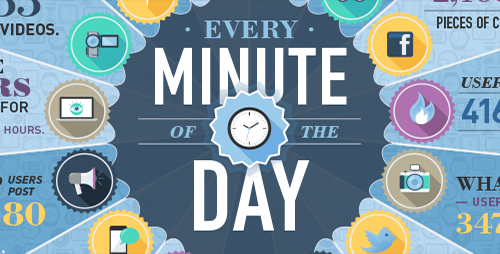 In just one minute, there are on average 2.5 million Facebook shares, 48,000 Apple apps downloaded and 3 days worth of YouTube videos uploaded! That’s an awful lot of digital activity taking place. Online business management company Domo have created this fascinating infographic to demonstrate the numbers behind what happens online in the space of just one minute. With worldwide internet usage growing by over 700% in the past five years (Source: Internet World Stats), we suspect that even by next year, this infographic will have changed considerably. The Apple Watch and similar devices, for example, will certainly drive considerable new mobile traffic. ‘Watch’ this space!